Sarah Fine joins JGKMW as an associate in the Seattle office. Sarah graduated in 2018 from Lewis & Clark Law School in Portland, Oregon. Prior to law school, she worked as a trial paralegal in a small medical practice defense firm in Oregon City, Oregon. While she was a law student, she worked for two years at the Multnomah County DA’s Office, where she prosecuted seven cases to decision. After graduation, she worked as a temporary clerk for the Honorable James R. Verellen of the Washington State Court of Appeals, Division I. Sarah is excited to bring her skills and experience to JGKMW. Welcome Sarah! JGKMW is pleased to announce that Phil deMaine has become a Fellow of the American College of Trial Lawyers, one of the premier legal associations in North America. The induction ceremony at which Mr. deMaine became a Fellow took place recently before an audience of 570 during the recent Induction Ceremony at the 2019 Spring Meeting of the College in La Quinta, California. The meeting had a total attendance of 750. Miranda Aye and Michelle Taft obtained a defense verdict on behalf of an emergency medicine physician whose patient suffered kidney failure after being prescribed an NSAID to treat the pain from a broken rib. Plaintiff alleged medical negligence and wrongful death for prescribing the NSAID after failing to recognize the patient’s chronic kidney disease. After a 3 ½ week trial, the jury returned a defense verdict finding that the physician met the standard of care. On November 18, 2016, one of our beloved employees, Alexandria Lewis, lost her life in a tragic accident at the dangerous McCarver Railroad Crossing near our Tacoma office. One year prior, a pedestrian lost his life at the same crossing while jogging. Attorney Phil deMaine took the lead role in advocating for safety improvements at this site. It was not an easy task, given the complexities of dealing with federal, state, and city laws and regulations. After nearly two years of tenacious advocacy, we are pleased to announce that safety improvements have been made, including new fencing, a new sidewalk, improved signage, and, most importantly, pedestrian gates to help prevent further pedestrian deaths. We believe these improvements will make Tacoma safer and ultimately save lives. September 10, 2018 – Defense verdict for Rando Wick and Michael McDermott. Rando Wick and Michael McDermott obtained a unanimous defense verdict for a neurosurgeon who had a complication resulting from a bone breaking off a pedicle during lumbar fusion surgery resulting in worsening foot drop. Plaintiff claimed negligence and a failure to obtain the patient’s informed consent. The defense verdict was obtained within a few hours after submitting the case to the jury. Congratulations Rando and Michael! August 20, 2018 – JGKMW welcomes Brennen Johnson to our firm. Brennen Johnson joins JGKMW as an associate in the Tacoma Office. Brennen brings his skills to JGKMW from his recently completed clerkship for U.S. District Court Judge Benjamin H. Settle. Brennen has worked on litigation ranging from personal injury claims to antitrust enforcement actions. Prior to his clerkship, Brennen worked in the Civil Division of the Pierce County Prosecuting Attorney’s office while he finished law school at the University of Washington. Welcome Brennen! 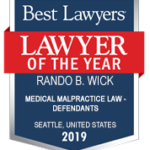 JGKMW is pleased to announce that Rando Wick was recently named “Lawyer of the Year” by The Best Lawyers in America© 2019 for his work in Medical Malpractice Law – Defendants in Seattle. Since it was first published in 1983, Best Lawyers has become universally regarded as the definitive guide to legal excellence. “Lawyer of the Year” recognitions are awarded to individual attorneys with the highest overall peer-feedback for a specific practice area and geographic location. Only one lawyer is recognized as the “Lawyer of the Year” for each specialty and location. Congratulations Rando!